It’s probably a bad idea to base a day trip around a single photo op, but there you have it. 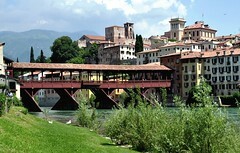 I once saw a picture of Bassano del Grappa that showed a covered bridge called the Ponte degli Alpini. I’m not sure why it appealed to me so. I think it was because the buildings on either side of the Brenta River were clearly Italian. To me, the warm colors, balconies, window boxes, and towers were reminiscent of Verona, another city I had liked in the Veneto. And yet the wooden bridge itself seemed so very un-Italian. With some minor alteration in the trusses, that bridge would have looked very much at home spanning a babbling brook in a forest of autumn leaves back in Vermont. I became determined to see a place at once so exotic and familiar for myself. I had hoped to visit Bassano del Grappa and two other small hill towns on a minibus tour offered by Avventure Bellissime, but they cancelled my booking last night due to a “lack of participants,” offering instead a tour of the Dolomites at the same price. I am two years removed from my disastrous trip to Germany and I still recoil at the thought of an alpine landscape. I suppose it’s a Pavlovian response, but I’d rather see the bridge. While on previous trips to Europe I’ve gotten up early and stayed out late, this morning I slept in and barely made the 10:27 AM train from Santa Lucia station, which means I won’t arrive in Bassano del Grappa until nearly noon. On the journey out, it didn’t occur to me that this was a problem, but it is. By the time I arrive and pick up a map from the local tourist information office, the city has fallen into a deep slumber. It’s the afternoon siesta, a tradition rarely observed in larger tourist destinations, but here, nearly everything—churches, museums, shops—will be closed for the next several hours. I’m just going to have to make do. I walk past the towering Torre Civica in Piazza Garibaldi, struck by the silence in the streets, and then continue on past the Loggia dei Podestà, with its sun dials and astronomical clock, to Piazza Libertà, from where I veer off to the right, down toward the river. Known alternately as the Ponte degli Alpini, or the Ponte Vecchio, there has been a bridge in this spot since least 1209, but over the centuries it’s been destroyed several times through acts of war, as well as the forces of nature. 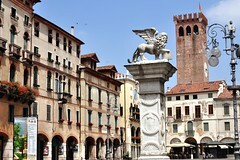 Each time, it has been faithfully rebuilt according to Palladio’s design of 1569. The bridge is open and airy inside, and it reminds me of a picnic pavilion somewhere in the Adirondacks. Standing here is pleasant, a cool retreat from the midday sun, and the view north of the Valsugana valley is nothing short of spectacular. To see it properly, though, I need to cross to the other side and walk along the banks of the Brenta. When I do, I look back and see the frame of the photograph I fell in love with so many months ago. Today, there are white clouds of cotton candy high overhead, floating in a pale blue sky. There is a wall of mountains in the distance and a cluster of pastel buildings in shades of lemon yellow and salmon pink spilling down over the hill toward the river. In the contrast between the elegant architecture of the town and the rustic red bridge with its large wooden feet, there is also balance. 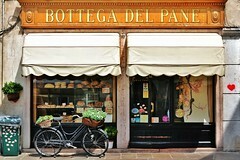 They marry well, or as the Italians might say, si sposano bene. For lunch, I buy a sandwich at Taverna al Ponte, which has a tiny balcony overlooking the bridge, and then wander back up through the town, past the ceramics museum in Palazzo Sturm, which is closed, and the church of Pieve di Santa Maria, which is closed as well. I should have known. The walk and the ascent up the hill tires me more than I expect, and by the time I reach the civic museum in the former convent of San Francesco—which is blessedly open for business—I need to sit and rest. Even so, I feel spent. Residual illness and jet lag are catching up with me. I rove through the impressive picture gallery upstairs, and marvel at a painting by Roberto Roberti titled “Il Ponte di Bassano” (1807) that shows the city looking much the same in the early 19th century as it does today. But the truth is, I’m ready to head back to Venice. It’s nearly 3:30 in the afternoon and the shops will be reopening any moment now. Even so, I don’t have the energy or the enthusiasm left to stay. I did what I came to do. After relaxing on the train and laying for a while in the my air conditioned room at the Hotel al Ponte Mocenigo, I feel surprisingly hungry later. Not wanting to go far, I have dinner at Il Refolo, in a small piazza facing the Ponte Ruga Vechia. 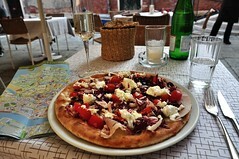 I order the “Pizza del Doge,” with fresh mozzarella cheese, ham, tomatoes, and radicchio, and remembering the previous night’s admonition, I decide that I do not want to be “the woman who no drink wine.” I order a glass of prosecco, figuring that one glass—just one—couldn’t possibly hurt. Except that it does. The pizza is outstanding, one of the best I’ve ever had in Italy, but the wine sends my head into a nasty tailspin for the remainder of the night. Cursing Germany once again (because, really, when is there ever opportunity enough? ), I know that to make it through I’ll have to go teetotal from here on out. I’ll be in Florence in two days time. I’m already mourning the Chianti.